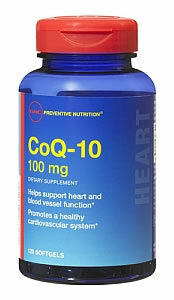 CoQ10 supplements are designed to help maintain healthy heart and cardiovascular functions. The energy that every cell needs to function is produced through a complex process in the mitochondria, an organelle within the cell, often called the cellular powerhouse. Cells store energy in a molecule called adenosine-5-triphosphate, or ATP. Thus ATP is synthesized and used by every cell in the body. CoQ10 is an essential part of the electron transport chain used to make ATP. GNC Preventive Nutrition� CoQ-10 100mg: Buy Now! 1. Sarter B. J Cardiovasc Nurs 2002;16(4):9-20. 2. Langsjoen PH, Langsjoen AM. Biofactors 1999;9:273-84. 3. Soja AM, Mortensen SA. Ugeskr Laeger 1997;159:7302-08. 4. Satta A, et al. Clin Ther 1991;13:754-57. 5. Kamikawa T, et al. Am J Cardiol 1985;56:247-51. 6. Littaru GP, Battino M, Folkers K. Handbook of Antioxidants. New York: Marcel Dekker; 1996. 7. Kagan VE, Nohl H, Quinn PJ. Handbook of Antioxidants. New York: Marcel Dekker; 1996. 8. Alleva R, et al. Mol Aspects Med 1997;81(Supp):S105-12. 9. Kontush A, et al. Biochim Biophys Acta 1995;1258:177-87. 10. Kalen A, et al. Lipids 1989;24:579-84. 11. Aberg F, et al. Eur J Clin Invest 1998;28:235-42. 12. Mortensen SA, et al. Mol Aspects Med 1997;18(Supp):S137-44. 13. Palomaki A, et al. FEBS Lett 1997;410:254-58.